Your search for the perfect breakfast sandwich is officially over. 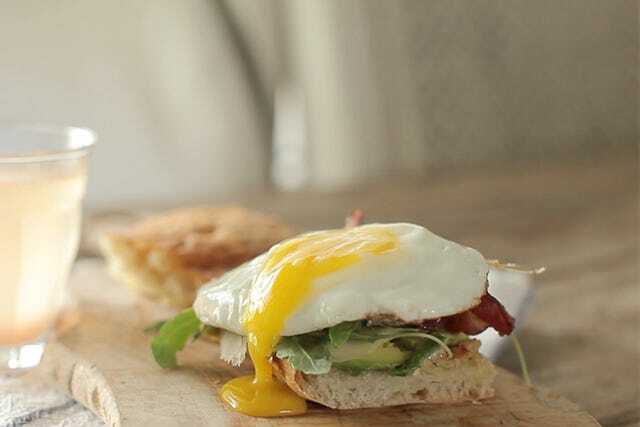 Enter this sandwich, packed with homemade spicy sauce, avocado, bacon, and of course, a fried egg. This is a treat bound to start any day out on the right foot. Dig in! Click to the next page to see directions, and a video tutorial! 1. Mix mayonnaise, Cholula, salt, and pepper in a bowl, set aside. 2. Fry bacon, starting on a cold skillet — fry on medium high heat for four to five minutes, flip and cook on other side for another one minute (drain on a paper towel). 3. Fry 2 eggs, sunny side up — medium heat for approximately five minutes. 4. Slice ciabatta bread in half, and brush with olive oil. 5. Heat over medium high heat until golden brown. 6. Spread spicy sauce, top with avocado (mashed), cheese, arugula, bacon, and 1 egg. Head over to Leaf.tv for more easy video recipes!